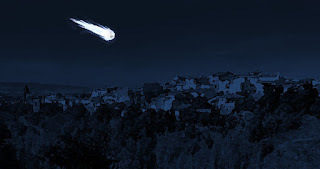 Inexplicata-The Journal of Hispanic Ufology: Spain: Fireball Passes Over Southern Spain. 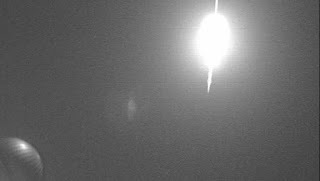 Fireball explodes some 108 kilometers north of Granada, caused by the reentry of a fragment of Comet Encke, at a speed of 110,000 kilometers per hour. A fireball caused by the reentry of a fragment of Comet Encke flew over southern Spain yesterday morning, coinciding with the glowing November supermoon. The phenomenon was detected by equipment installed by the University of Huelva at the Complejo Astronómico de La Hita (Toledo) and observatories at Sierra Nevada (Granada), La Sagra (Granada) y Sevilla. According to a press release from the Complejo Astronómico de La Hita, an analysis by professor Jose María Madiedo has determined that the fireball was indeed caused by the reentry of a fragment of Comet Encke into the atmosphere. The impact took palce at 0355 hours to the north of Granada near the locality of Algarinejo. The fireball moved rapidly in a northeasterly direction before extingushing itself sixty kilometers over southern Jaén province.